Grocery shopping in France can be a sublime experience. I know that as for me I could very happily move into the dairy aisle of our local E.Leclerc in Beaune tomorrow. Nevertheless, like many things in France grocery shopping is different than back home. Below I will share the four cardinal rules for grocery shopping in France. After you master these, all that will be left for you to do is drool and enjoy. You will need a euro, 50 centimes coin, or a plastic jeton which are free on request at the grocery stores to plug into the shopping carts. Only then will you be allowed to take one. At the beginning of your trip go to the customer service desk in any grocery store and ask for five (cinq) jetons. This should do for your trip, unless you are like Franck and keep losing them. You are given them back when you return the shopping cart. I try to keep a supply of jetons in each of our gites, but like adaptor plugs these items often go AWOL. Free baskets are available in the store, but they are small and get full and heavy very quickly. Did I mention the dairy aisle??? You’re not alone if you forget to do this. I regularly arrive at the cash resister without weighing my fruit and get yelled at by the cashier. This is because when grocery shopping I am very often in a dreamworld of my own, often induced by the the little plastic cups of chocolate liegois I have just ogled in the dairy aisle. However, you will find a handy set of digital scales in the fruit and vegetable section of any decent sized French grocery store. They are not there for entertainment purposes. You put your fruit and veg – and please don’t mix your Golden and Gala apples – in a plastic bag, press the button with the handy photo of the type of fruit or veg you have in your plastic bag, and the scale spits out an adhesive price ticket. You stick this on your fruit / veg bag. Repeat as necessary. This may actually earn you a smile from the cashier (but not necessarily, see below). To save France from an invasion of discarded plastic grocery bags – as you may have noticed, the French struggle with the “put garbage in a garbage can” concept – all large grocery stores in France do not supply grocery bags. However, they do sell recyclable grocery bags which you can buy and then bring with you every time you do a grocery trip. Another option is to buy a classic market bag at a local market and use that as your grocery bag. Of course if you are like me you will have fifty grocery bags in your basement and yet still forget one every time you go grocery shopping. This means driving home with produce rolling around in your trunk. As far as I’m concerned, this is perfectly acceptable. It is no secret the French have a lot of style, and their grocery bags are no exception. The recyclable grocery bags are often really cool looking, like the Pop Art one above and below I recently bought on yet another grocery trip where I forgot my bags. They make great and seriously inexpensive (under a Euro) souvenirs. Franck worked as a grocery store bag boy when he was in University, but this concept has gone the way of the dinosaures in France. You are expected to bag your groceries yourself, and très vite! Grocery store cashiers are poorly paid and saddled with a stressful, repetitive job. As far as the French are concerned, it would be downright inhumane to expect them to act cheerful to boot. If the grocery store personnel smile at you, consider it sincere (maybe you, unlike me, have remembered to weigh your apples and bring your bags). If they scowl and yell at you, don’t take it personally – it is their right. This entry was posted in Authentic France Travel Tips on March 30, 2009 by admin. I guess I was being a bit of a toughie, so here’a a good hint. 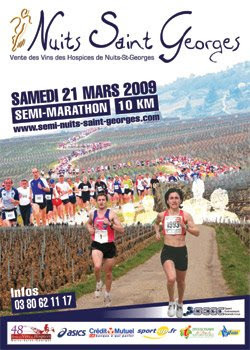 It was located in something that was on the route of the Nuits-Saint-Georges 10K and Half-marathon race on March 21st. This entry was posted in Où Sommes-Nous? on March 30, 2009 by admin. If you get this one your are officially a France expert, and deserve a nice big wheel of Comte. 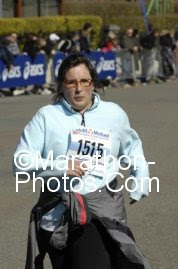 This entry was posted in Où Sommes-Nous? on March 19, 2009 by admin.